Scientists extrude the core from its barrel. Ice cores are obtained by drilling core samples of ice in regions where glaciation has occured, such are near the Arctice and Antarctic Circes. 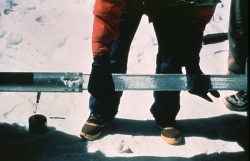 Visible light and dark rings can be found in such cores that are then analyzed to determine the age of the ice. These layers are presumed to be the result of annual fluxuations in climate, and using this method, uniformitarians purport ages of over 100,000 years. Creationists, such as Michael Oard, contend that these laminations are from subannual events, including layering due to dust to be found in a post-flood ice age. Sub-annual formation is supported by observations that several such layers of snow and ice can result from the storms within a single winter season. The rapid rate at which ice sheets can accumulate is further demonstrated by the case of the Lost squadron . In 1952, P-38 Lightning fighter planes ran out of gas and landed in Greenland. Then in 1990, a group started looking for the planes. They finally found them in May, 1992, under 250 ft. and hundreds of layers of ice. Now it is true that neither of these is representative of the glaciers used for ice core analyses today, but they could have been representative of those glaciers in the past. This problem is recognized by those who date ice cores and so they use a number of other methods to find the annual layers. However most articles do not make a distinction between these so called annual layers and the visible layers. While these methods work well for relatively recent ice as one goes back in time they become less certain. One such method is 10Be/9Be isotopic analysis, but over time diffusion renders it useless in detecting annual distinctions. Likewise, 18O/16O isotopic analysis suffers from diffusion as well. Ice flow also blurs any indication of years so that ages for deeper ice are derived from models of variations in accumulation rate and ice flow. This makes ice core dating very dependent on the theoretical models used; as such, none of these methods are independent indicators of age nor are they calibrated to climatic models. Carbon-14 (14C) is also used to assign dates to ice cores but it has itself been partially calibrated to ice cores and therefore it is not an independent method. All ice core "dates" are derived by calibrating the various methods to the Uniformitarian theoretical system. When calibrated to the Creation theoretical system the dates derived agree with time of the Biblical flood. 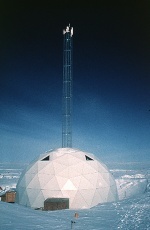 In 2004, the North Greenland Ice Core Project uncovered the remains of plants in an ice core of Greenland. The plant matter, buried 10,400 feet deep, was "the first organic material ever recovered from a deep ice-core drilling project" according to Prof. James White. Dorthe Dahl-Jensen, a professor at the Niels Bohr Institute and the leader of the project, said the plant matter suggested that the Greenland Ice Sheet "formed very fast." In 2005, research published in the journal Geology significantly lowered the estimated age of glacial ice from 8 million years to less than 310,000 and even as low as 43,000 years. Ice Cores and the Age of the Earth by Larry Vardiman, ICR Impact No. 226, April 1992, Institute for Creation Research. Do Greenland ice cores show over one hundred thousand years of annual layers? by Michael Oard 2001. Creation Ex Nihilo Technical Journal 15(3):39–42. Willerslev et al, “Ancient Biomolecules from Deep Ice Cores Reveal a Forested Southern Greenland,” Science, 6 July 2007: Vol. 317. no. 5834, pp. 111-114, DOI: 10.1126/science.1141758. This page was last modified on 24 November 2015, at 17:07.